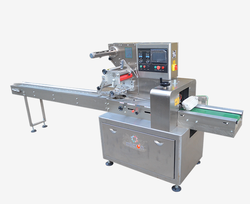 We are engaged in presenting an extensive range of Flow Wrap Machine to our clients. Additionally, customers can avail these machines at competitive prices. Raj Engineers Industries is a premier manufacturer, supplier and exporter of best quality horizontal flow wrapper machines (Model: RJ-098). 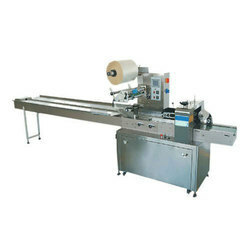 We offer a wide range of quality flow wrap machines that are manufactured using the hi-tech machines. Our flow wrap machines enables to wrap a diverse range of products for range of industries. Our flow wrap machines find its applications in biscuit manufacturing industries. We offer customized products as per the requirements of the client. Applicable for packing various irregular objects, Adhesive objects and Solid objects, such as food including Egg Rolls, Sausages, Squids, Instant noodles, Snow cakes, Preserved Fruits, Jelly drops, Soaps, Detergents, Chikkies, Tissues etc. Samarpan Fabricators PVT. Ltd., the pioneers in packaging solutions, presents, the Lotus series, state of the art horizontal form, fill seal machines. Designed to suit the requirements of various products spread over diverse industries, these machines occupy less space and are very easy to operate. They are versatile enough to adapt to different products, shapes and wrapping material.